Although it may seem more like a Photoshop filter app, the ability to dynamically change patterns in realtime to address tonal values in the photograph make “PXL” stand out, with its several drawing modes such as horizontal straws, 3D blocks, black and white shapes, news print dots and sliding bars. German-based designer Rainer Kohlberger’s other multi-iplatform app, “field”, takes a more abstract approach to image composition by using the camera to translate color values seen by the camera into a dynamically changing abstract geometric patterns and tonal composition. 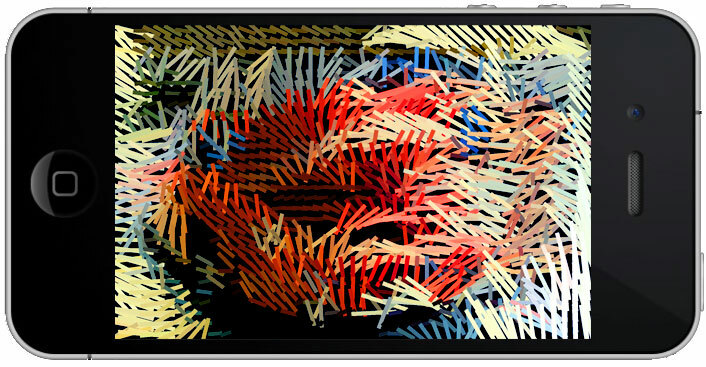 “MakeGo” by UK based artist Chris O’Shea utilizes the accelerometer sensors in the iPhone to create a bird’s eye view on the screen of several different vehicles including a race car, an ice cream truck, and fishing boat. The accelerometers detect when the toy is pushed and in the case of the race car, the car makes the appropriate accelerating sounds of the motor revving up. This app is intended to be accompanied by a lego base for the iPhone to sit on with attached wheels to make it “Go”. Erin Kennedy’s “Apps for Arduino” are simple yet intuitive ways of connecting your iOS device to the Arduino controller. “Meters For Arduino” visualizes its connection to Arduino through a vintage VU interface that mimics the old magnoelectric meters that measured values using a scale printed on the back plate of the device. The arms swings back and forth based on the incoming values from the pins on the Arduino that are being monitored. Her website includes a sample Arduino sketch that can be uploaded to the hardware and used with the app. These apps, along with her Mac OSX software “Buttons for Arduino” which provides a simple colorful button interface that allows one to control output pins on the Arduino by clicking the buttons. Jody Zellen’s “Urban Rhythms” is a visualization of the way in which people navigate through urban spaces. 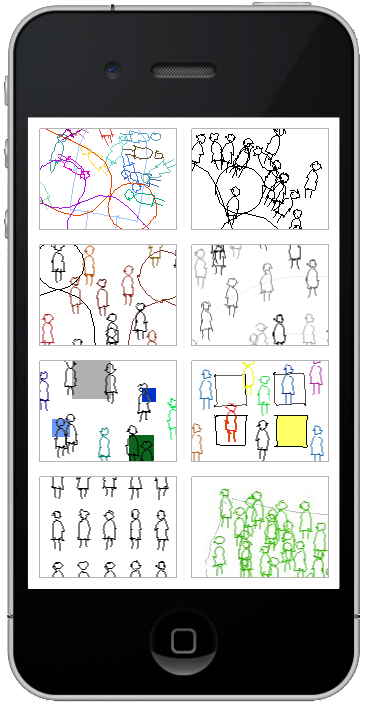 The app displays people as stick figures wandering through a city. This free app is a playful jaunt into discovery of how life moves at a rapid pace specific to the location it is situated within. One of her other apps, “Art Swipe” is based on the Surrealist game of Exquisite Corpse and allows users to create three part collages from over 100 images from the Los Angeles County Museum of Art’s public domain library as well as use the device’s camera to snap photos which can be added to the mix. a quick plug for an app i have just released. This work captures the ephemeral act of wandering and extends drawing into the use of new technology such as GPS recorders, to challenge the assumptions of what drawing is or might be. It takes inspiration from, amongst other artists, Sol LeWitt’s Wall Drawings, along with Ben Nicholson's reinterpretations of the landscape and his use of technological developments at the time. The app creates drawings which are made from a combination of a walk I took, using GPS to capturing my locations - how far, how fast and how high I have travelled. This data is then combined with your location as picked up via your phones GPS and translated into images that develop frame by frame to create a moving image. Each time you load this app you will see a new individual movie. The results are playful and seem almost random, but are drawn according to an exact set of guidelines. I see the code that I create as my pencil; I am sketching the landscape, interpreting the GPS data as an abstract visual. Also based on this work I have made a film to be shown during the Olympics here in UK - Parallels and Meridians – Beyond the Boundaries (http://youtu.be/FKzYb1_546Q). This uses a GPS recorded walk on Portland to draw the landscape I have walked through.